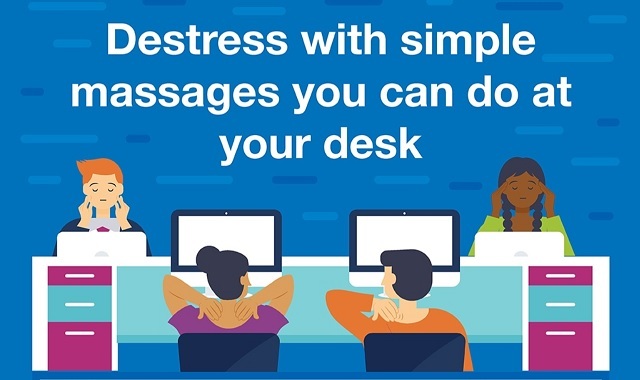 Destress with these simple massages you can do at your desk #infographic ~ Visualistan '+g+"
Sitting at a desk hour after hour, day after day can be a pain in the neck. Office jobs—and consistent lack of movement—can take a toll on your whole body and leave you with tired, sore, tense muscles. While you can’t exactly call up a masseuse to visit you on the job, there are helpful, stress-relieving self-massage techniques you can use to alleviate muscle pain. Self massage—either with your hands, elbows, or a tennis ball—is not only less expensive than a professional massage (it’s free! ), it’s also an effective way to improve blood circulation, stimulate the lymphatic system, and increase mental alertness. While self-massage isn’t a cure all, taking a few minutes to reduce head, neck, jaw, shoulder, wrist, forearm, knee, and foot pain can help you more comfortably get through the work day. Read on for instructions.